Photographer: Phillip Dixon. Model(s): Daria Pleggenkuhle. Source: Numéro China. Stylist: Joseph Carle. Makeup: Anthony Merante / Yiotis Panayiotou. Beauty begins on the beachfront of the mind. Daria Pleggenkuhle is an artful extension of poetic reflection in Phillip Dixon’s sublime series shot for the 2013 June/July issue of Numéro China. 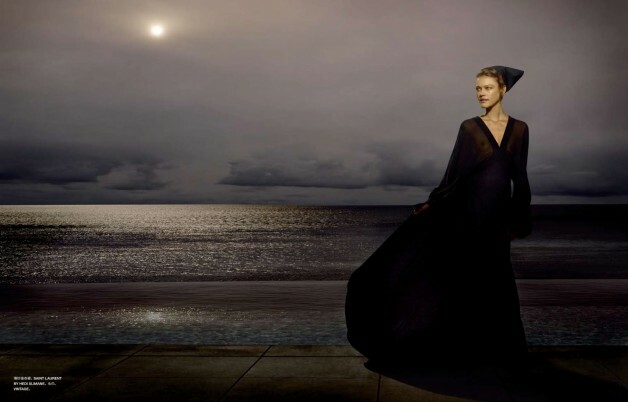 High fashion seeking higher ground, today’s greatest photographers are able to transport us to a place of transcendent tranquility. A place where thoughts are free to wonder without the brutal scrutiny of reality, and where creativity flows like water with ideas formed in the blink of an eye. A sanctuary of solitude, inside this eloquent illusion colors take on an other-worldly glow and the incandescent light of love serves as an endless source of motivation and support. Here the spirit of inspiration takes hold providing a portal for which pure art can pour through. And it’s here, in this mindful state of coerced clarity, we are reminded that it is only through authentic originality that we can truly know artistic peace. Through the sanctity of spiritual awakening we will always find the resiliency to reach beyond what we already know in search of something greater. With the expert use of effects this insightful editorial aims to ascend the heights of enlightenment offering a unique vision of expanded reality – Dixon’s depiction of Utopia.